MasterChef Australia judge Gary Mehigan gets his own series from next week on TEN combining his two passions: fine food and fast bikes. 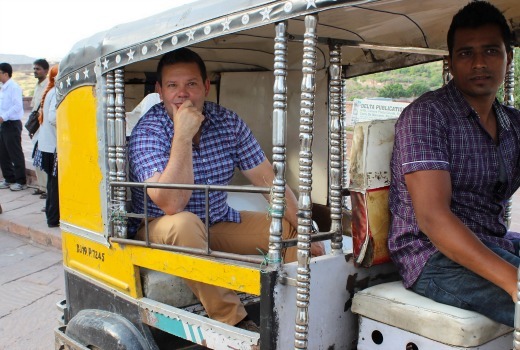 Far Flung with Gary Mehigan is six-part culinary road trip through Asia. Far Flung is more than just a cookery show, as Gary combines his pleasure of meeting new people and trying new things with his need for speed to create six vivid travel diaries. In the first episode, Gary heads to India, uncovering the secret of the Tiffin box. He discovers the craziness of the country’s capital Delhi, where he eats street food India-style, and immerses himself in the cacophony that is the Old Spice markets. Gary then heads home to cook up his first Indian-inspired dish, dosa masala. 6pm Saturday July 25 on TEN. Smells a lot like a pet project of his that he requested as part of his signing on for more Masterchef when his contract was up for renewal? 6pm.. Saturday, was 4am Wednesday not available?